The Atacama Desert is famous for being the world’s driest desert. Normally, only true survivalist species make it in this rather hostile environment: thorny cacti and shrubs, as well as dun guanacos, foxes, lizards and other desert creatures often use protective mimicry and are hard to spot, often making the desert seem completely uninhabited to visitors. However, every three to five years an impressive natural spectacle covers the sandy plains with a beautiful carpet of flowers: “El Desierto Florido”, or the flowery desert. Up to 200 endemic flower species emerge, some of whose seeds have been dormant in the soil for up to 10 years before the rain and sun stimulated their germination. A great number of insects and birds are also attracted by this phenomenon, and they form a very special ecosystem during the blooming period. The impact of this phenomenon is dependent on the amount of rain, and there has not been as much rain this winter as in other Desierto Florido years. Not all corners of the Atacama will bear flowers, but if you have the chance, the phenomenon is worth a side trip. Visitors who would like to see this unique blooming desert will have to act fast, because as Chilean spring progresses, the flowers will wither, depositing their seeds in the ground to rest until the next cycle. 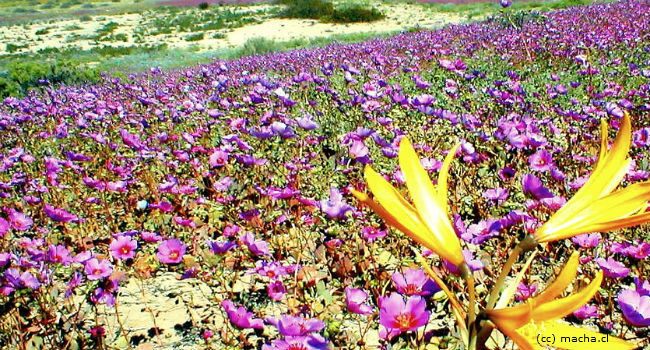 The best places to view the flowery desert are between La Serena, Vallenar and Copiapó, as well as in the Llanos del Challe National Park (near Vallenar) and the Pan de Azucar National Park (north of Copiapó). If you have questions about the flowery desert phenomenon or about our tours in northern Chile, please do not hesitate to contact your travelArt sales partner.